"Time travelling magicians Morgan & West present a jaw dropping, heart stopping, brain busting, opinion adjusting, death defying, mind frying, spirit lifting, paradigm shifting, outlook changing, furniture rearranging magic extravaganza! Morgan & West have fooled Penn & Teller (Fool Us ITV1), competed to be the Next Great Magician (ITV1), and even attempted to escape The Slammer (CBBC). Witness a mountain of mysterious magic, a hatful of hyper-reality, and of course a truck full of tricks and tea. 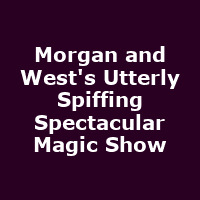 Mixing brain boggling illusion and good old fashioned tom-foolery, Morgan & West present a show for all the family, where magic and silliness abound!"